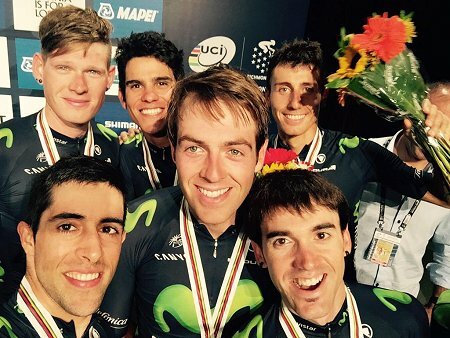 The 2015 racing season of Essex’s Alex Dowsett (Movistar Team) took on a suitable autumnal bronze hue on Sunday as the 26 year old played his team role to the full in helping his 6-man Movistar squad into 3rd place in the UCI World Team Time Trial championships, this year being held in Richmond, Virginia, USA. And the team’s podium placing also meant that the elite Spanish outfit returned to the top of the sport’s team standings – a position it held at the end of the 2013 and 2014 racing seasons – with only two week’s racing to go. Movistar covered the 38.8km course just 30 seconds behind the championship winning ride of 2014 champions BMC at an average speed of just under 55kph. On a course built for powerful riders, Movistar managed its riders well through their ride, ensuring there was a much power available in the closing kilometres where the riders had to tackle two climbs. That they rode a consistent time trial can be seen for their intermediate timings, moving from 6th positional after 10km to fourth in the second intermediate check (17km) and, eventually, third with 7km remaining as other teams burnt out their riders too soon. “I’m really pleased that result” said Dowsett. “Since the Tour things haven’t all been plain sailing for me, there seems to have been lots of little setbacks but hopefully this result means I’m putting proper form together at the end of the season”. But that didn’t translate to the form he wanted in his debut ride in the Tour de France as a race defining crash on the main cobbled stage of the Tour meant Alex had to retire from the race because of his injuries before the half way point. And a stomach bug in the subsequent Tour of Poland meant that he lost 4 kilos in a very short space of time and wasn’t able to compete in the key time trial stage of the race and the chance to pick up precious World Tour points. “That’s what makes this bronze medal so much more rewarding” he explained. “I wanted to lose some of the muscle weight I’d put on training for the Hour record before the start of the Tour. I didn’t do so but certainly didn’t intend doing so as dramatically as I did in Poland”. “But now my form is again starting to build and I’m pleased about that. We rode impressively in the TTT, linking well together. It was a fast course more suited to power riders but the climbers we had in our line up knew how to ride a time trial so they were there when we needed them”. The Worlds continue for Alex with the individual time trial on Wednesday – to be held over 53kms – before the epic 259.2km road race on Sunday. Dowsett rides the TT knowing that he or his Team GB team-mate Steve Cummings – who won a stage in the Tour de France this year – need to finish inside the top ten to help GB qualify another rider for next year’s Rio Olympics TT. “I think I’ve got a ride like that in me. I’ve finished in the top ten in the Worlds TT before’ – Alex was 8th overall in 2012 – ‘but to repeat a ride like that I know I’ve simply got to go as fast as I can and maintain that speed over the whole distance”.